The last decade. From the advent of the blogosphere, through the phenomenon of ‘cool hunters’, and to its logical peak in Instagram; the cut and thrust shareability of aesthetic has catapulted creativity into a new stratosphere. Never more so has there been a collective awareness of design, art, and craft. Cafés in rural Welsh towns share visual reference points with those who broke ground a few short years earlier in Melbourne, New York, or … Jakarta. Because Jakarta has hipsters exposed to exactly the same reference points as those (albeit fewer) hipsters in Aberystwyth. Life through the filter of a smartphone screen. Shared experiences, and creative innovation almost a preloaded chip ready to slot in somewhere behind the ear. For some that’s a sickening pill to swallow. For others, it’s a blessing. An opening of doors that in the 1990s would have remained resolutely shut. ‘Internet sensation’ isn’t just a thing that happens to grumpy cats or pre-pubescent YouTubers you’ve never heard of; creatives who 15 years ago would have wiled away their free time producing great stuff that no bugger will ever see now ‘go viral’. You’ll see these innovative works bounce around the virtual echo chamber, bloggers will clamour for a few quotes, countless others will just copy and paste, then you’ll probably see their work in a high street quick-fashion store without a royalty being shed. But that’s a gripe for another day. Thing is, the whole dizzying experience is a lot more gratifying for the creative than a pre-internet ‘keep up the good work’ from mum would’ve been. Cape Town creative Danielle Clough encapsulates both the pre- and post-viral world. 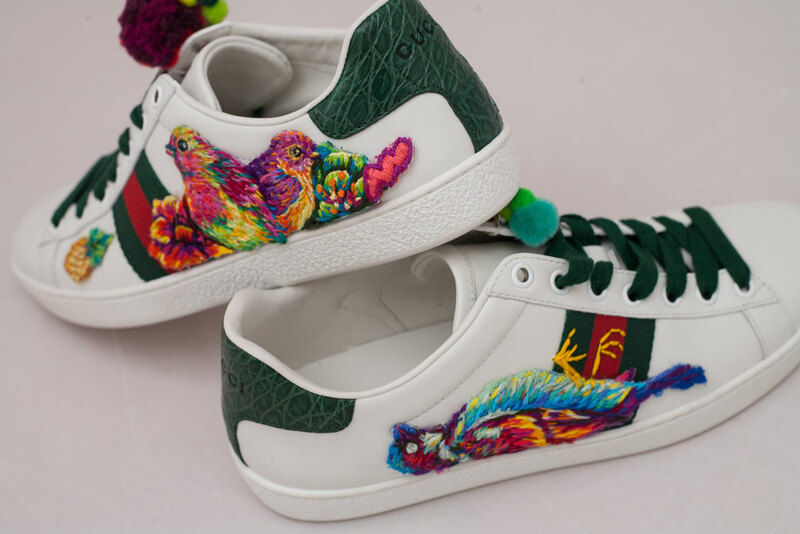 The craft that she has become known for is as timeless as can be; mum teaching her how to sew as a child, Clough’s embroidery work personifies the tweeness of after-school craft clubs. With pop culture portraits and fashion collaborations, though, the artist is a readymade case study for the viral generation. Countless creatives are featured by countless blogs, mind. 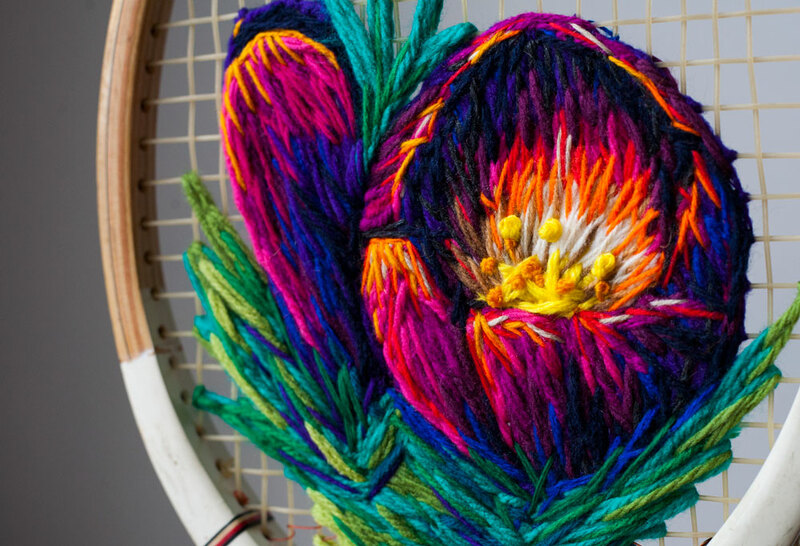 Like a great mathematical equation, many elements come together to jettison something off on its viral way — vivid embroidery, pretty flowers, and an array of vintage racquets would be Danielle’s formula. 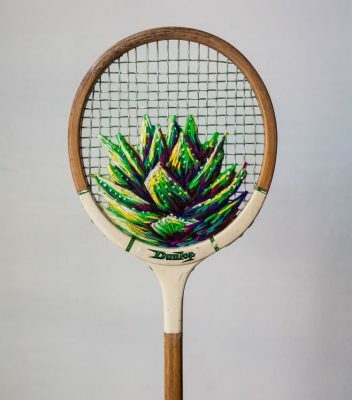 Using her flea market-sourced strung bats as a canvas and posting the results out on social media, Clough’s work blew up in 2015; everyone from Vogue to the New York Times looking for a piece of the action. Which must have been a surprise for the suburban Cape Towner, having openly admitted to battling with her own sense of worth and confidence. ‘It’s one of my greatest struggles,’ the artist explains in an interview with blog I Am Online, ‘the guilt that comes with feeling like you’ve not delivered the best you can.’ It’s a common feeling for erratic creatives who struggle to bed themselves down into one particular niche, and must be amplified in Clough’s case; ‘forever bound to the hyphen’ she has confessed. Quite. 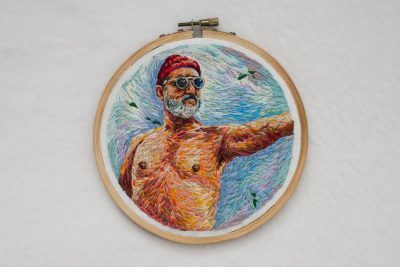 Danielle refers to herself as a photographer, visual jockey, designer, and (of course) embroiderer, but has delved into plenty more disciplines over the years. ‘I tried a lot of things on for size,’ she tells the New York Times; having indicated that the spark that lit her creative lifestyle resulted from a friend’s unconventional praise of her 12 year-old doodlings: ‘I would totally tattoo that on myself,’ her enthusiastic pal’s response. 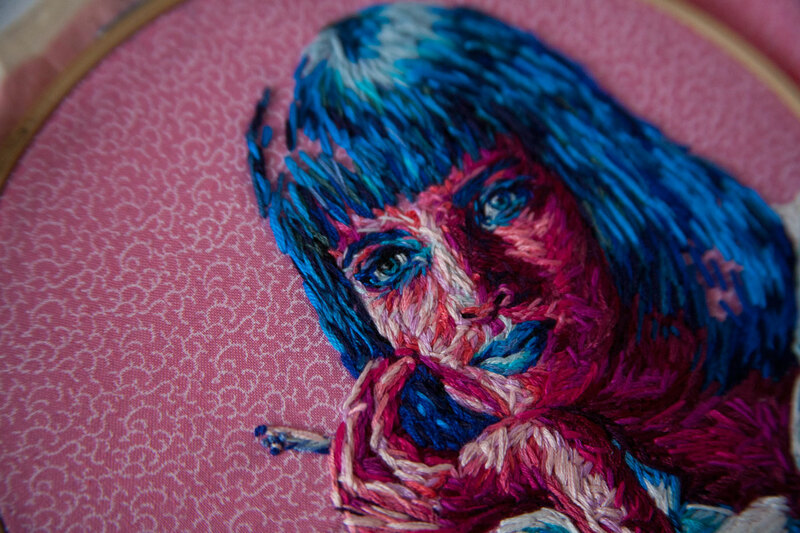 Some decades have passed, but unpredictability remains; the South African creative dons the stage name Fiance Knowles, and has performed with a ruck of internationally-renowned acts; she embroiders Wes Anderson- and Quentin Tarantino-inspired artworks; gets involved in conceptual art exhibitions; appears on local radio and creates custom book covers. Designer, collaborator, artist, woman about town; you get the sense that internet sensation or no internet sensation, Danielle Clough will always be a restless creative impossible to pin down.